On the 17th of May 2011, CLAROS went live with a launch event at Wolfson College, Oxford. The project aims to “bring the world of ancient art onto the semantic web”, and comprises the CLAROS Explorer, an image search interface, and a site which exposes the data as RDF. Data are provided by partners, who model their collections using RDF and the Erlangen OWL-DL 1.0 implementation of the CIDOC Conceptual Reference Model. Shortly after launching we were invited to join the Pelagios consortium, and we’re delighted to be on board. We’re in the process of co-referencing all the places referred to by our partners. For example this ewer was found within the Ashmolean’s conceptualisation of Henan province, which is (eventually) contained within a ‘centralised’ concept of China. This allows us to find fifty things from Greece, Buddha-related objects from Thailand, and lots of places we believe are within Greece. We’ve created a dump of our data should anyone else want to play with it. At some point soon we’ll change the names of the graphs in the triplestore to match these, so that the graphs are also dereferenceable. In the interests of trend-setting, we’ve also got a semantic pingback server running on the off-chance that there are similarly-minded people out there. We need to keep co-referencing our places. We’ve done a lot of the low-hanging fruit (those that are mentioned a lot and/or are easily found), but from here on in it’s the law of diminishing returns. So far we’re linking against Pleiades and Geonames where we can, and using the CRM’s “falls within” property to create a hierarchy of containment. We’ve also discovered a few instances of places in the source data we don’t know how to model. For example, “between Kermanshah and Dezful”; look these places up on a map and you discover they’re 352km apart by road, so taking a colinear equidistant point isn’t very helpful. As well as ‘betweenness’, we can’t do uncertainty (e.g. “Athens (? )”), or proximity (e.g. “near Athens”). I still need to get my head around OAC and how that relates to what we’re doing. At the moment we’re using skos:closeMatch and skos:exactMatch to link our places to their Geonames and Pleiades counterparts. I had thought about using property reification vocabulary (PRV) to create something to attach provenance information to, but it’s possible that this could all be handled within OAC. Suggestions welcome (and probably much needed!). Nomisma.org is a Pelagios partner that is “minting” stable URIs for concepts within numismatics. To date, we have URI’s for mints, coin hoards, some rulers, and a few other general numismatic concepts. The small map below is just a quick overview of Nomisma’s European, Asian and African mappable IDs. An ID in nomisma takes the form of a short URI, as in http://nomisma.org/id/corinth or http://nomisma.org/id/igch1546. Clicking through to the Corinth ID shows you the location of the mint and as well as locations of hoards that have coins of Corinth in them. The reverse relationship is mapped for a hoard so you’ll see the findspot of the hoard and the locations of the mints of coins found in it. These are nice maps of one aspect of economic and cultural exchange in the ancient world. A longer post would talk more about the vagueness of the concept “mint”, but here I’ll just let this mention stand-in for discussion of the issue. As per discussion on this blog and on the Pelagios list, the body of the annotation is set to the Pleiades URI and the target is the Nomisma.org URI. Again on the basis of preliminary discussion, I’m using rdfs:seeAlso to link to the wikipedia page when Nomisma.org knows that relationship. That falls into the “Why not?” category. Nomisma.org’s goal in participating in Pelagios is very simple. When Pelagios stands-up an aggregator by which users can find Internet resources relevant to the Pleiades URI for Corinth, we want Nomisma.org to show up in that list. I could phrase this as “providing open data within Internet enabled research environments…” or some other language, but I think it’s better to keep things simple. We want people to use our data and if participating in Pelagios helps that, well then, here we are. For those who care about technical details, we are using the rdf:ID construct in the rdf file linked above. If you look at the root element, you’ll see the xml:base attribute is set to http://nomisma.org/nomisma.org.pelagios.rdf. An RDF processor will pick that up and turn the @rdf:ID on each rdf:Description into a full URI along the lines of ‘http://nomisma.org/nomisma.org.pelagios.rdf#corinth‘. This is a slight convenience for me. I don’t have to make any adjustments to the Nomisma.org server other than putting the RDF file in an accessible location. I have added the element ‘<link rel=”x-pelagios-oac-serialization” title=”Pelagios compatible version” type=”application/rdf+xml” href=”http://nomisma.org/nomisma.org.pelagios.rdf”/>’ to the html head of Nomisma.org so that any future “Pelagios crawler” can find the right RDF representation. Overall, OAC is such a simple model that it’s pretty trivial to instantiate the links between Nomisma.org and Pleiades using the conventions Pelagios is promoting. Being part of a community like Pelagios means, in part, adhering to the consensus that develops about its use of standards and I’m happy to do that. But there was one decision that didn’t go my way that I think is still interesting. To retrace some steps that have been discussed in previous posts and on the Pelagios list, an OAC annotation has two main parts: a body and a target. As the creator of annotations within the Pelagios ecosystem, it made sense to me that the body would be the Nomisma.org URI and the target would be the Pleiades resource. To the extent our ecosystem is distributed but bound together by our common use of Pleiades IDs, I find the metaphor of a number of annotations “targeted” at Pleiades URIs to be straightforward. I’m comfortable with the idea that the Pleiades URI http://pleiades.stoa.org/places/570182 is a definition of of the ancient site of Corinth and that I, as a contributor to Nomisma, am saying something about it; as in, providing “information which is annotating the Target”. And there’s a hint of concern that by making the Pleiades URI the body, Pelagios is suggesting that Pleiades completely defines what we as a community say about the concept of Corinth. I’m tempted by the converse modeling of the Pelagios eco-system: the definition of Corinth is the sum total of all the Pelagios annotations with the bodies of those annotations capturing the content generated at the edges, not at the center. But Nomisma.org conforms to the community convention and will going forward. I’m just intrigued by the rhetorical aspects of how we’re using OAC. Pelagios is funded by JISC under the GECO (Geospatial Engagement and Community Outreach) activity. In all #jiscGEO has some twelve “15/10” geo projects, whose common overall aims include increasing the use of geospatial tools, establishing a trajectory for embedding geospatial resources within a research and learning environment, and promoting best practice (particularly interoperability) for transferring knowledge from specialist to user. Subjects range from working with trainee science teachers or monitoring the spread of moths with a smart phone app to making use of geospatial tools for solving real world problems and visualizing urban energy reduction. Pelagios is proud to be associated with these efforts and hopes that its work can help contribute to GECO’s overarching purpose to foster communities of users of geospatial resources (data, services and support). Following the productive Pelagios workshop at KCL, we (DME) have been busy tweaking our infrastructure to interoperate according to the “Pelagios Principles”. For DME, the situation is slightly different than for Pelagios’ other data partners: First, our existing data model is already based on OAC – which does probably make our transition somewhat easier. Second, instead of owning an extensive existing data set, our “asset” is an end-user toolkit for manual annotation and semantic tagging of multimedia content (affectionately referred to as YUMA – the YUMA Universal Multimedia Annotator). In other words: instead of mapping existing place references in our data to URIs in the Pleiades namespace, our primary task was to modify YUMA in such a way that users can, from now on, tag media items with references to Pleiades places! First, we needed to incorporate a list of Pleiades place names (and their URIs) into our Tag Server. The Tag Server is the component which hosts tag vocabularies and provides the tag suggestions for the auto-completion hints. We got a Pleiades CSV data dump, from which we built an index using Apache Lucene, and set up the index as an additional tag source. Second, we needed to provide a ‘Pelagios’ view on our internal data to the outside world. The reason for this is that our existing RDF representation (although based on OAC) is close, but not identical to the Pelagios model. We therefore set up an alternative RDF output channel, mapped to a .pelagios suffix. Appending this suffix to the annotation URI will return Pelagios-compatible annotations, in either RDF/XML, N3 or Turtle notation based on content negotiation. So, you’ve got your locations all beautifully geoparsed, but how is anyone going to search for Liévin, let alone Łódź or Uherské Hradiště? In the old days of the web, this wasn’t a problem. They couldn’t. At least, not without a huge amount of learning and expense on everyone’s part. In the English-speaking world, text on the web meant ASCII. This restricted you, basically, to the characters on a standard US keyboard: 128 characters, a third of which were things like ‘tab’ and ‘line feed’. If you wanted your readers to read ‘é’, you sent them a something called an entity (&eacute; in this case). If you wanted your readers to read ‘Ł’, you might even have to send them a little image of the letter. This was stupid, obviously. And, thank god, we now have browsers, databases, and programming languages that speak a different text ‘language’: UTF-8 (Unicode). This gives us millions and millions of characters, and means that if you want people to read ‘š’, or even ‘אַ’, you can send them plain text and not have to worry too much about operating systems, browser support, or reproducing 2000 .gif files whenever you change your site design (been there, done that, please don’t judge if you haven’t supported Internet Explorer 4). But this only solves half of the problem: reading, but not writing. If you have to type ‘Ł’, and you’re using a standard US/UK keyboard, we haven’t come very far. The existing methods are either clumsy, slow, or require a lot of memorisation (or all three). It’s all very well expecting admins to take a bit of extra time to enter the correct name – although a little bit of AJAX and GeoNames means that they don’t have to. But, as this rather forthright blog points out, is it realistic to expect this from our users? To give you an example of how this applies to the Pleiades data, take the case of Mérida, in Spain. Mérida (Roman Emerita Augusta, Pleiades 256155, GeoNames 2513917) is quite an important location for the APGRD (Archive of Performances of Greek and Roman Drama), as its wonderfully preserved Roman theatre is the venue for many new versions of classical plays – last year’s Lysistrata, for example (warning, very slightly NSFW!). Because the APGRD has no time frame – we’re interested in every single performance, from antiquity onwards – many of our users won’t know that Mérida used to be Emerita Augusta, so I can’t rely on them searching for that. However, a search on the Pleiades dataset for Merida (no accent) returns no results because for the computer, ‘Merida’ and ‘Mérida’ are two different values. I imagine those of a non-English-speaking background will be tempted to say “so what, we’ve been typing non-ASCII characters all our lives – you do know our keyboards look different, don’t you?”. Likewise, those who’ve spent the effort learning the betacode or combining unicode commands to get the best out of TLG and Perseus may be less forgiving. people don’t necessarily know that a location has non-ASCII characters, or what the right ones are (pop quiz, no googling: how do you (properly) spell Liege?). They’ll get no results and not realise that they’ve entered the wrong search string. a substantial proportion of people, even academics, have no idea how to enter non-ASCII characters – and even those that can are generally only good at doing it in languages/ character sets with which they are familiar. of these, how many are going to cut-and-paste text from elsewhere (which does not always give you the characters you want)? So, I’m sure of the problem, but not necessarily of the solution. It seems to me that the best way to do this might be to convert all search strings to ASCII before matching them against ASCII-ised locations (at least, for user search). But does this lead to a horrible loss of precision? Are there better ways? And I have it easy – all my locations are at least in the Latin alphabet! In our extant literature from the Greco-Roman world, Claudius Ptolemy’s Geography is a unique treatise on mathematical cartography. Its relevance for Pelagios is in part that it includes the largest scientific data set to survive from antiquity: more than 6000 named points are located with longitude-latitude coordinates in books 2-7, and more than 350 key cities are again located in an alternate astronomical coordinate system in book 8. The text of book 1 provides a systematic introduction, including two methods for drawing world maps. Books 7 and 8 include instructions for other kinds of visualizations. 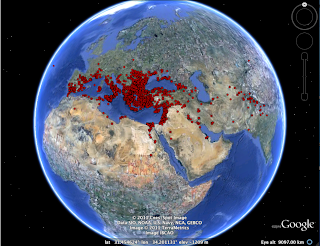 With its combination of methods and data, Ptolemy’s text is a kind of software for GIS. Ptolemy includes specific suggestions about how to realize his plan in hardware: he goes beyond the mathematical theory to discuss machinery and physical procedures for constructing maps. Scribes manually copying the text of the Geography applied these procedures directly to create maps in their manuscripts, but print editions have obscured the nature of Ptolemy’s project as a dynamic (if not rapid) GIS. During the period of the Pelagios project, I’m planning to complement the text-view of the Geography at ptolemymachine.appspot.com with a GIS view of Ptolemy’s text exposed through one or more network services. (I am still experimenting with a variety of options; I’m a newcomer to Google’s Fusion Tables, but am impressed with their easy access to people who want to mash up geographic features, in the spirit of Pelagios.) I’m looking foward to seeing what others might do with this material. Note: The following post is heavily based on notes by Mathieu D’Aquin and Sebastian Heath. using the OWLIM triple store with a Sesame interface. A new class was created called GeoAnnotation. Intuitively, this class represent the oac:Annnotation(s) that point to (oac:hasBody) geographical objects (wgs84_pos:SpatialThing). we can obtain a list of potential annotations from Arachne, with information about images relating to places, that can have modern and ancient names. There are (apparently) a bit more than 5000 items in this list, running the same similarity-based process as above, we could relate a bit more than 2000 of them to Pleiades URIs. For example, the place “Hispania” (http://pleiades.stoa.org/places/1027) is the body of 1 DME (geo)annotation and 4 Arachne (geo)annotations (see http://kmi-web01.open.ac.uk:8080/openrdf-workbench/repositories/pelagiosTest/explore?resource=%3Chttp%3A%2F%2Fpleiades.stoa.org%2Fplaces%2F1027%3E. 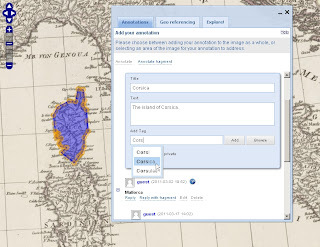 There are different kinds of GeoAnnotation (and different types of documents considered). For example, some data would mention both documents about the location, and documents that cite the location, but are about something else. Maps of particular locations might have a specific status, as well. 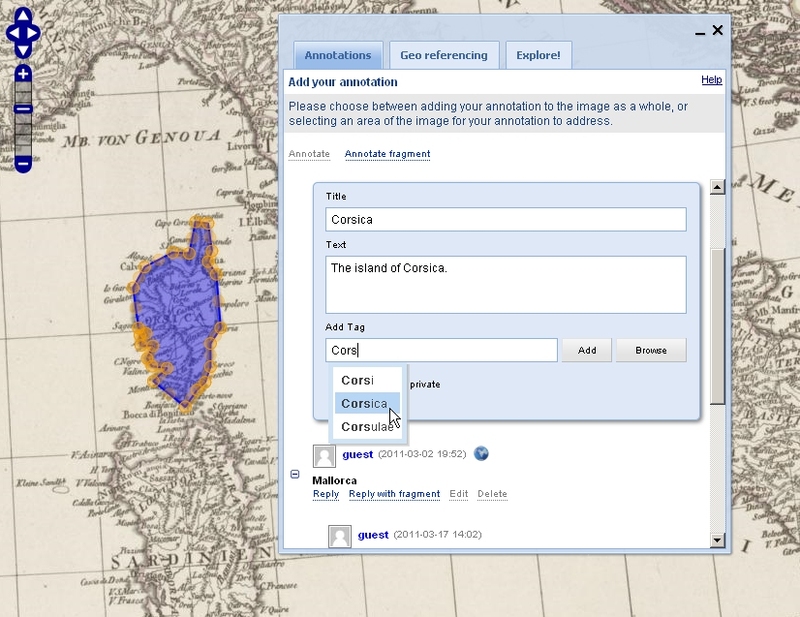 We could add sub-properties of oac:hasTarget for example or subclasses of GeoAnnotation. In addition Mathieu’s work, Sebastian Heath has been considering implmentations in RDFa. It is common to use the html element ‘link’ within an html ‘head’ to indicate the location of alternate versions of web resource. The most common application of this convention is to indicate the presence of Atom or RSS feeds. Resource authors/publishers can use the following convention to indicate the location of RDF-serialized Pelagios-compatible oac:Annotations. The @rel MUST be equal to “x-pelagios-oac-serialization“. The @type SHOULD match the mime type of the resource pointed to by @href. The value of the title attribute is not significant. Authors MUST NOT use it to communicate any information to the Pelagios crawler. The Arts Faculty Research Grants Manager is Suzanne Duncanson-Hunter. She is working closely with both the PI and CoI to make sure that the project keeps to budget. The PI and CoI are also in close correspondence with the JISC manager over how best to manage costs and utilise resources. In addition, the Open University, through Suzanne’s efforts, have already drawn up an external consultancy contract with Rainer Simon of DME for work to be undertaken on Pelagios in WP3. The ontology work undertaken by LUCERO in WP1 complements the funding that they already have from JISC. Furthermore, all work on ontology specification, mapping and alignment done by the data and documentation partners (GAP, Perseus, DME, SPQR, Arachne) and Pleiades is payment In Kind. Because all of our partners are already committed to linked open data research and have secured sustainable and significant funding for themselves, Pelagios is able to make substantial research and infrastructural advances on a relatively modest budget, thus greatly maximizing Return On Investment for both JISC and project partners. This is encapsulated by our ‘start-up’ event, the one-day workshop at KCL, which presents a unique opportunity for an intensive exchange of knowledge and experience on Linked Open GeoData from the community at large, as well as from all of our partners. For this reason we are intending to record the proceedings to help document the discussion of issues and methods relating to linking open data ontologies, so that it may be of use for other groups working in this area in the future. Our budget ensures that all invited external expert speakers will have UK costs borne, while also paying for the time and expenses of all the Pelagios partners, for both their participation at the workshop and the project meeting on the following day. Part of Pelagios’ first Workpackage is to decide on a Common Ontology for Place References (COPR). In doing so we are not attempting to reinvent the wheel – far from it. Good Linked Open Data practice is to reduce, reuse and recycle. To that end we have been investigating a variety of options and are now basing our approach on the Open Annotation Collaboration ontology. The OAC is also a work in progress but, as luck would have it, they are holding their workshop in Chicago on exactly the same dates as ours (we now have a great line-up, btw, so register soon as places are filling up). Their fundamental principles seem to be exactly what we are looking for though: the ability to connect a target web document with some information about it (in our case, an ancient place). But a number of interesting issues remain – should we use Blank Nodes for the annotations themselves (especially in RDFa)? If not, where do we store them? Should we subclass the OAC ontology to specify that it is a geographic annotation? If so should it be the oac:Annotation or oac:hasBody that we subclass, and where should that ontology be hosted? We are fortunate to have the assistance of Bernhard Haslhofer and Robert Sanderson in this discussion, who are both involved with OAC and look forward to them reporting back from OAC’s workshop. In the meantime Mathieu D’Aquin is putting together our own SPARQL demonstrator to see how useful this approach may be in practice. If you have any thoughts on this do let us know and you can follow the discussion itself over on our Google Group. Pelagios is divided into three work packages (WP), centred on the three stated outputs of the project: core ontology development; application of that ontology to the project partners’ sample datasets, and documentation of the process; and development of web resources to trial and show the value of the ontology for users. · Hosting a one-day workshop that is open to all members of the community* with three sessions dedicated to: 1) Issues of referencing ancient and contemporary places online; 2) Lightweight ontology approaches; 3) Methods for generating, publishing and consuming compliant data. Each session will consist of several short (15 min) papers followed by half an hour of open discussion. · A monthly meeting comprising of the PI, Co-I and one representative from each of the partners is established for checking progress, identifying and resolving common issues, planning for the forthcoming month’s activities, ensuring aims are met, and disseminating the project outcomes. · In the run-up to the workshop, a smaller group comprising of the PI, Co-I one representative from the development partners meet to discuss the ontology development. · The PI and Co-I meet once a month with their JISC PM, David Flanders, to ensure that the project is on target. · This email group keeps partners informed of deadlines and to-dos. · It also hosts discussion of work flows, issues and methodologies. All communication is archived for the benefit of the broader community. In addition, the PI and Co-I will make one visit to each partner during the ontology application process. Rapid-iteration Agile methods will be used for software development.